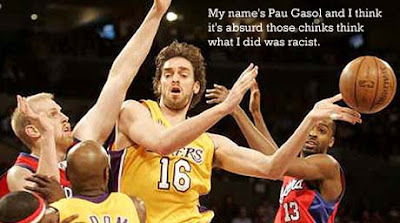 While I was going to just let this drop after my last post, I can't help but not write you a little something after I read in the Sporting News that you thought it was "absurd" people were calling the gesture racist you and the Spanish basketball team posed for, and that it was really just supposed to be "funny". I mean I know you're soft (we all do now after seeing you play in the Finals), but to be honest, I really didn't think that extended to brain tissue, and even though I know what you meant by funny - a bunch of white guys making fun of us chinky bastards - I'm still a little confused on the "absurd" comment. Did you mean absurd as in "It's really absurd Anne Frank would hate the Nazis" absurd, or absurd as in "It's absurd that Phil Jackson calls me a weenie and I'm getting booed by millions of Asian American Lakers' fans who are calling for me to be traded" absurd?